Well, the Bombogenesis is here. We on the coast have been having torrential rain and strengthening winds for hours now, and the lights are flickering every few minutes. I would say that we are probably going to lose power shortly to the wind and crazy fluctuations in the atmosphere. I don’t know how many of you out there are Susan Cooper fans (she is an awesome British author of some of my favorite books – she is also a poet). I have been a big fan of her fiction for many years. Her Dark is Rising Sequence series being one of my faves. Every year around Solstice and Christmas I try to either read The Dark is Rising, or watch it’s movie equivalent, The Seeker: Dark is Rising. Having to rely on Netflix DVD delivery meant that today was the day I received it, and so we had a wild viewing of it while the lights flickered and the wind howled outside. Quite the most dramatic rendition I can remember! It was extremely atmospheric and it made me quite jumpy, what with the wild wind and the relentless rain on our metal roof. I was very glad when Ian McShane and his friends prevailed over the Dark. Phew! Another year. Again, a wonderful story. Darkness and Light, the eternal struggle. One in which most of us are fixated upon as we watch the light gain strength, even as the winter deepens. It’s a funny thing, winter growing as the light returns. It’s just one of those things that we can celebrate or fight. Tonight I am feeling a little bit of hope. It’s always the way. The first lambs or kids get all the attention. We have been spending a lot of time out in the greenhouse with our new little one. She is a sturdy little bugger! She’s getting to that hoppity stage and is even cuter than the day she was born and had a bent ear (the ear fixed itself). Yesterday we made the jug twice the size it was, and now she has more room to hop. She is loving every new encounter, and is a delight. I have not been obsessive about weighing her, but when I did yesterday, she had gained a solid 2.5 lbs in 4 days. Her belly is always full when I check on them, and she most usually has milky-mouth, which is also a good sign! I have been home for a few days with a three week old cold that turned into pneumonia. I thought the cold was just pushing my asthma to rebel, but that obviously wasn’t the case. I am feeling a little better today, but the antibiotics are harsh. Eating my yogurt is helping. It’s also given me some uninterrupted time for catching up on some reading. I just finished The Girls of Atomic City by Denise Kiernan. It’s a very detailed look at what life was like in the secrecy of Oak Ridge, Tennessee, while uranium was being enriched for the Manhattan Project and the town and enriching plants were being built as they went. I would have loved to have been present for many of the interviews that the author was able to do with so many of the women who went to work there in 1942/43, many of whom are still there, in their late 80s and early 90s now. Amazing. As much as I hate nuclear weapons, and don’t even support nuclear energy, their stories are amazing. I love reading about how women have coped and triumphed throughout history, even without being given much credit. I highly recommend it! I still have not formulated what name our new girl is living up to. Hopefully she will make it clear soon! It’s another weather roller coaster. 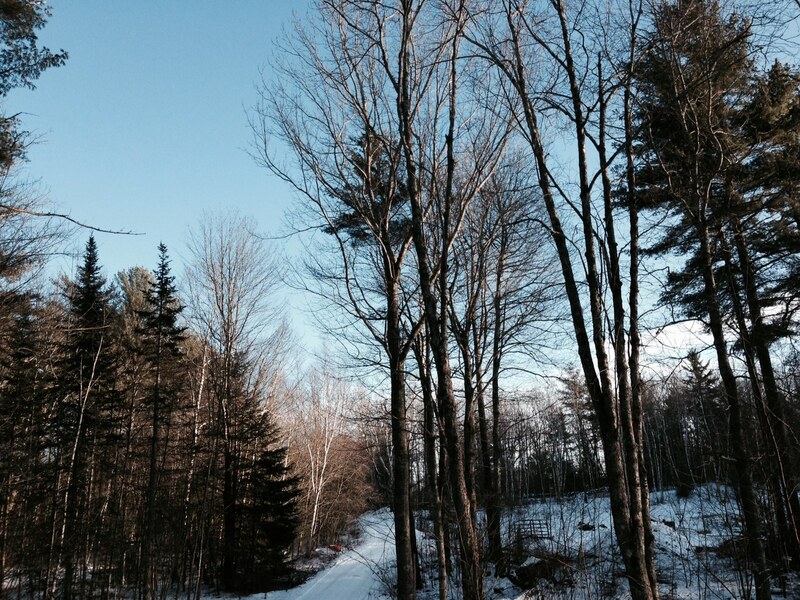 Yesterday was the quintessential winter day: gusty wind, grey rolling clouds, occasional blowing snow. AND around 30 degrees. I didn’t even need a hat to do afternoon chores! Of course overnight it stayed fairly warm, only down into the upper teens, but as today wore on, with beautiful clear blue skies, the temperature fell. It’s about 10F right now and breezy. Supposedly tomorrow will be warmer again, with some snow showers. Perhaps I will be able to pry some of the ice out of the bottom of the boys’ water bucket. 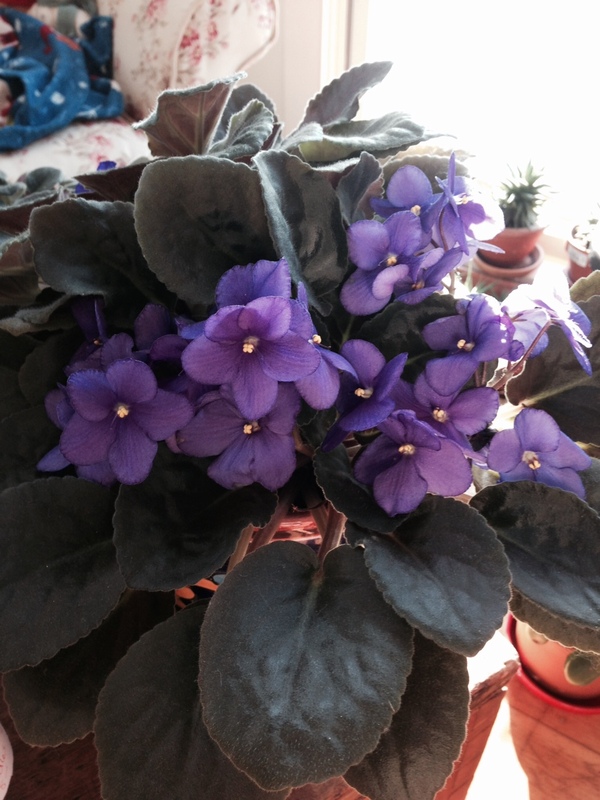 The African violet is again in full bloom! Today was a general cleanup day. I have been trying to make a dent in the paper pile on the table, along with catching up on a little cooking (meatballs and sauce) and kitchen cleanup. I have done a little more knitting on my Hitchhiker, and also became engrossed in a my newest mystery read, Christopher Fowler’s Bryant & May/Peculiar Crimes Unit series. I do not know how I have missed this, there are at least 10 books in the series and I am hooked. The first book, Full Dark House, opens with the last case that the two friends will solve, and keeps going back to the first case that they worked in 1940 wartime London. Fowler’s use of language is superb, and I love the history and mystery combined. I am a mystery junkie, and British mysteries in particular are some of my favorites. So it was a good day all around, with the exception of the return of the cold temps! They say it’s going to be a big one. I waited to go out and do chores this morning until I really couldn’t put it off anymore without making myself late for work, in the hopes of getting a call about whether or not there would be any school today. Waiting until 6 a.m. makes it ever so much easier to do chores in the semi-daylight, rather than the abject darkness, but I finally went out about 5:15 and as I stepped out the door it began flurrying. No big deal, as they were predicting only a little bit before evening, but apparently this bit of the storm was moving faster than they thought, and before I was through with chores I had the text message saying school was cancelled. 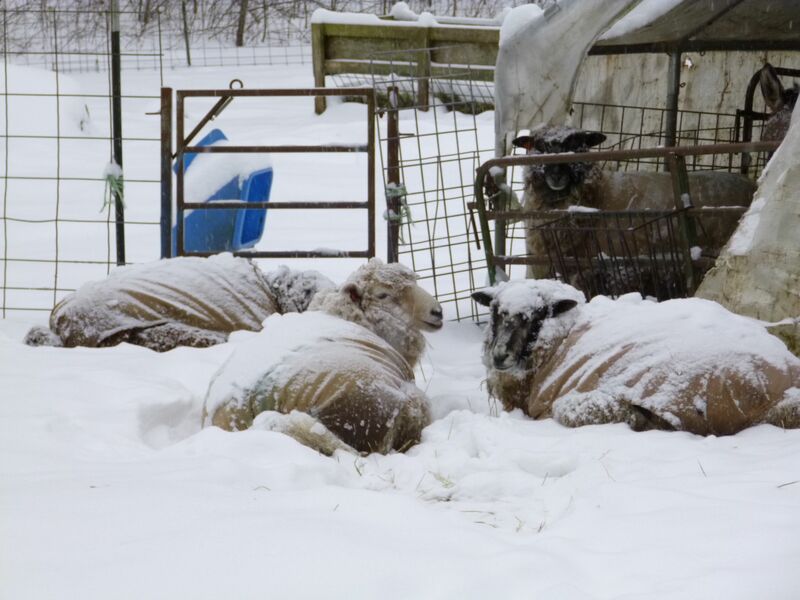 I am glad we got to stay home as the snow has gotten deep pretty quickly, although it’s very dry and easily moved. I am really not looking forward to tonight, however, which is when hurricane force winds are predicted along the coast, bringing about 2′ of snow with it overnight. At least it’s a weekend and most folks won’t have to go anyplace, I hope. And so we wait. Delicious to have a little “found” time on my hands, I began prepping for a batch of soap. Since I am drying off the does and not milking every day, the amount I got on Wednesday was perfect for this. Not enough to make a decent amount of cheese, but enough for two batches of soap. So I measured out the milk in the glass bowl that I use for the lye mixture, and then I made room for it in one of our huge chest freezers, and popped it in. Then I took a little nap, followed by a wonderful hour finishing off some of my “work” reading. What a chore! Not! Being a young adult librarian, most of the reading I do is young adult literature, which I thoroughly enjoy. Two of the kids at the middle school have been raving about a book by one of the most popular young adult authors, Dan Gutman, that is currently on this year’s Maine Student Book Award list (about 40 titles chosen as a challenge to kids to read from varying genres and from a highly recommended list). 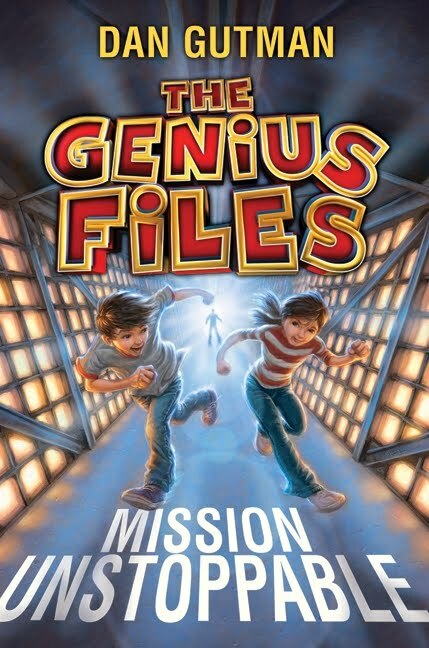 Gutman’s first book in the Genius Files series is a hoot (Mission Unstoppable). Lots of young adult humor, action-packed, totally plot driven (read here: not much character development) and is full of as much crazy, unnecessary trivia about the USA as anyone can ask for! Twins on a cross-country trip who are being tracked by an evil genius, their lives in danger at every turn, while visiting the largest ball of twine in Minnesota, the Pez museum, and more. Dan Gutman’s books are always kid-pleasers, but this one is a little different than his others. Kids at school are already asking for the sequels. It was definitely a fun read. Now on to some soap-making and perhaps some knitting! I am usually a pretty even-tempered person, but my bursitis flare up has turned me into someone I almost don’t recognize. Excruciating pain that won’t go away is obviously the root of this evil, and I have not been thinking about much of anything at all, except getting through every day without crying in public. I might have welcomed a rental in Oscar the Grouch’s can… at least people would know what to expect! I really thought that I could get my hip under control with ice and ibuprofen, but by Thursday I knew it was not working, so I saw the doctor and he gave me a cortisone shot with anesthetic (had these years ago with varied success). When the anesthetic wore off, however, my hip was still pretty bad, although a touch better. I am pretty much always in motion, but I have been forced to take it easy so John has been doing more of the chores and I have been using the ice packs religiously. I am presuming that the whole hip area was so inflamed that it’s going to take awhile to get back to being my normal little bit gimpy, but I wish I could fast forward that timeline a little! I have so much to get done while the weather is this perfectly autumnally gorgeous! Grump, grump, grump. Whine, whine whine! Bonbel’s girls staying out of trouble for once! 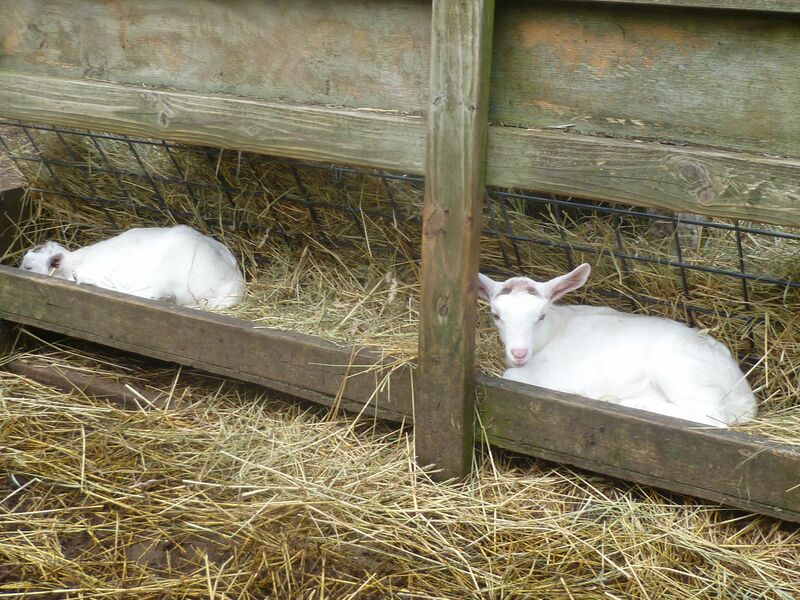 We spent the rest of yesterday checking on our little doelings and making sure that they had fly repellent on them. Our special little one spent most of the day tucked in beside her mother sleeping, and I have to give Pippi a lot of credit, she hung with her baby until dinnertime without being far from her. By the time I did chores last night the little one was playing hard with her sister and her cousins while the moms got down to serious eating. So I think she is on the mend and her hornbud looks dry and hopefully uninviting to the local fly population! Last night we had a wonderful meeting of our Salt Bay Treadlers in Damariscotta. It was an extremely fun evening with plenty of food, laughter and spinning. I got to bed a lot later than usual due to my asthma acting up, but it was ok as I didn’t have to get up at any specific time today. It turned out to be a much more pleasant day than I had expected and I got a bunch of things accomplished. I didn’t get down to the Round Pond parade due to my breathing, but I got some organizing around the kitchen done which made me feel a lot better. And then I spent most of the afternoon catching up on a book I am reading, The Olive Farm by Carol Drinkwater. I started this book a few years ago and then work got crazy and I put it aside. It’s one of my favorite types of “adult” reading, a memoir of a woman changing her focus in life. Buying an olive farm in Provence and all of the attendant woes is right up my alley. I loved all of the Peter Mayle books about moving to Provence and I am equally enjoying Carol Drinkwater’s experiences in southern France. It’s nice to be able to take a humid afternoon off to just sit and read and I am happy that I did. Some of the stress of the schoolyear is beginning to ease. It was a good day!